Process control systems provide precise control of liquids and gases in industrial areas including power generation, petrochemicals, food processing, and manufacturing. These systems control liquid and gas variables like flow rate, pressure, temperature, liquid level, density, and pH levels. Amatrol’s Level and Flow Process Control training system (T5552) covers two types of process control systems, flow and liquid level. Learners use this process control training system to study process control concepts and practice hands-on process control skills like calibrating, adjusting, installing, operating, and connecting process control systems in industrial applications. 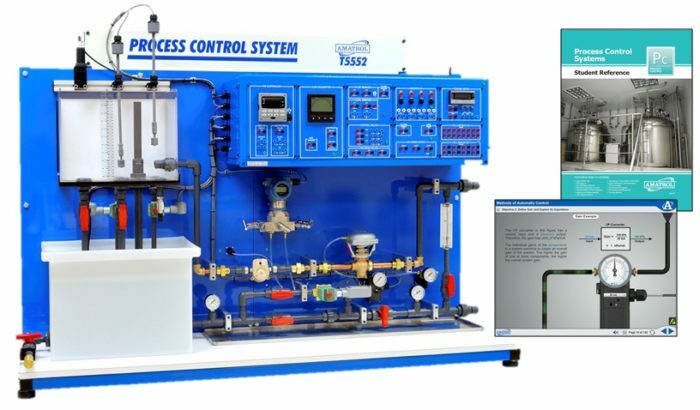 This level and flow process control simulator includes a bench-top workstation, process control network, control panel, and an interactive online process control training course. The workstation is constructed of heavy-duty, welded steel. Industrial quality components are mounted and plumbed in a closed loop circuit to control the water flow between two tanks or the liquid level in one tank. All components are connected to banana jacks on the control panel, allowing students to measure signals and connect devices in a variety of control configurations. This process control training system offers three types of controllers: relay control, standard, and two options: PID controller and PLC control. This allows students to study a wide range of process control methods. The relay control includes manual input switches, control relays, solenoid valves, and float switches to perform automatic on/off liquid level control. The PID controller option enables variable electronic control of either liquid level or flow and the PLC controller option enables both on/off and PID control of the system. Manual valves are used to switch between the PID and on/off control methods. The process control training simulator offers a wide variety of transducers and control valves, enabling students to study a full range of process instrumentation technology. Optional transducers and valves can be quickly interchanged with the standard ones via hand-tightened pipe unions and plug-in electrical connections. Amatrol’s unmatched multimedia utilizes text, audio, and stunning 3D animations that engage learners in both theoretical knowledge and hands-on skills. This online process control training course begins with the basics and steadily advance to more complex concepts and skills. Through partnerships with key industry leaders and leading edge educators, Amatrol developed the right balance of knowledge and applied skills needed to train learners to work in their chosen field. A sample copy of this course’s Student Reference Guide is included with the learning system. Sourced from the process control multimedia curriculum, the Student Reference Guide takes the entire series’ technical content contained in the learning objectives and combines them into one perfect-bound book. If you would like to inquire about purchasing additional Student Reference Guides for your program, contact your local Amatrol Representative for more information.